But for those suffering through China’s oppressive smog seasons, cans of mountain-fresh Kiwi air are worth every penny. 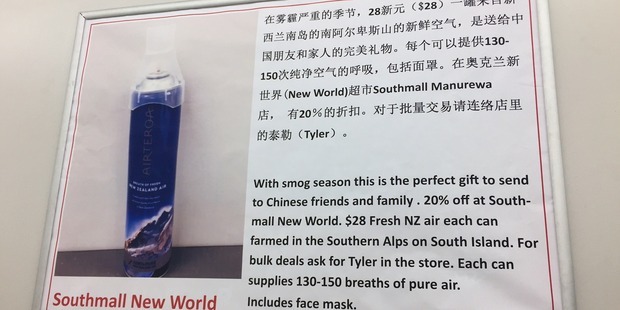 The product may sound like a joke, but Massey University marketing lecturer Henry Chung said there was huge demand for canned air in China. Air pollution in China could be so overwhelming and the country’s population so enormous it created a ready-made market, Chung said. To use the product people attach the can’s lid, which doubles as a face mask, to the can’s nozzle and push down to release a breath of fresh air. At first Chung thought the idea seemed crazy – but in fact it proved to be very popular among Chinese people with medium to high incomes. Canadian company Vitality Air pioneered the product in 2015, selling air from the Rocky Mountains. 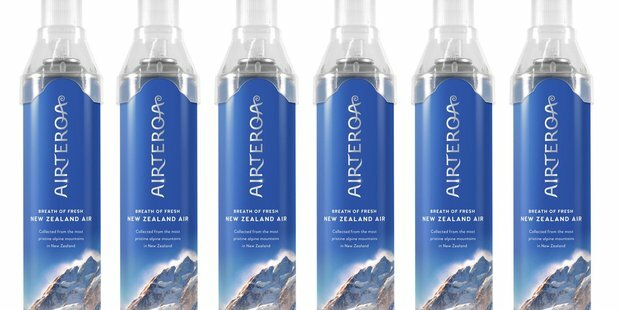 Just over a year ago Ryan Dill-Russell decided to do the same thing here, launching Airteroa and capitalising on New Zealand’s clean-and-green image. Dill-Russell called what he does “air farming”. Unwilling to give too much of his “trade secrets” away, Dill-Russell simply said he sends mobile canisters out to various South Island locations to gather air. We’re mostly in the southern alps at the moment,” he said. Air is collected into a high-pressure vessel and transported back to Airteroa’s base in Christchurch, where the air is redistributed into low-pressure canisters. The cans sell online for $35 a pop, each containing between 120 and 150 breaths. Dill-Russell’s biggest market was China, but there was also growing interest in Korea and India, he said. He had also recently tested the market in New Zealand, selling cans at the Southmall New World in Manurewa. He had had some success, mainly with Chinese New Zealanders buying air to send back home to friends and family as gifts. “The clientele is a bit of a mixed bag,” Dill-Russell said. Rival companies were popping up all the time, comparing canned air’s rising popularity to bottled water’s success before it, Dill-Russel said. Feeling blessed that the air we breathe is fresh and free !